Oh that sun feels soooo good! The sun is starting to warm up and hopefully winter is on its last legs. 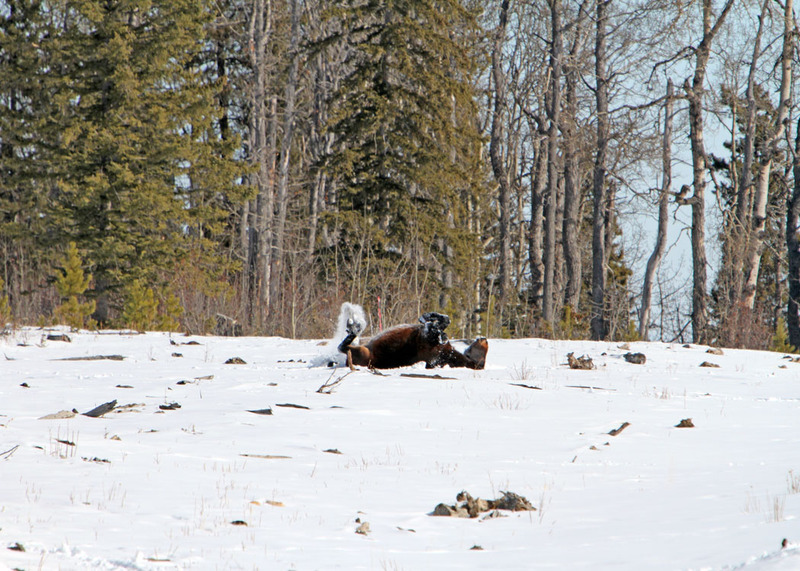 The horses are using the open hillsides to enjoy the warmth that the early spring sun brings. A recent couple of weeks have brought an onslaught of new snow which has covered areas that had been exposed for a period of time. This has caused the horses to roam a little bit more foraging for feed. As the sun rises higher it will not take long for the grasses to be exposed again for the horses. This is especially important for easing the stress on the pregnant mares, many appear close to term, as their feeding will be a lot easier. We are still grateful that there was not capture season this year where young ones like this one had to be taken away from their natural range and their families. As you can see they are fat, healthy heading into their second year of life. 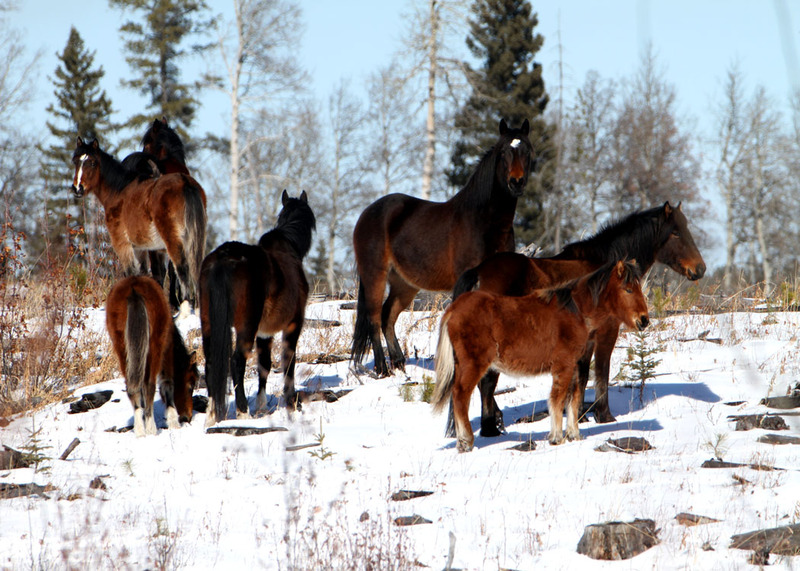 It is hoped this year that Mother Nature will cooperate to help the foals that are born this year to survive their first few months. In our travels it is quite obvious that many herds do not have foals from last year with them. 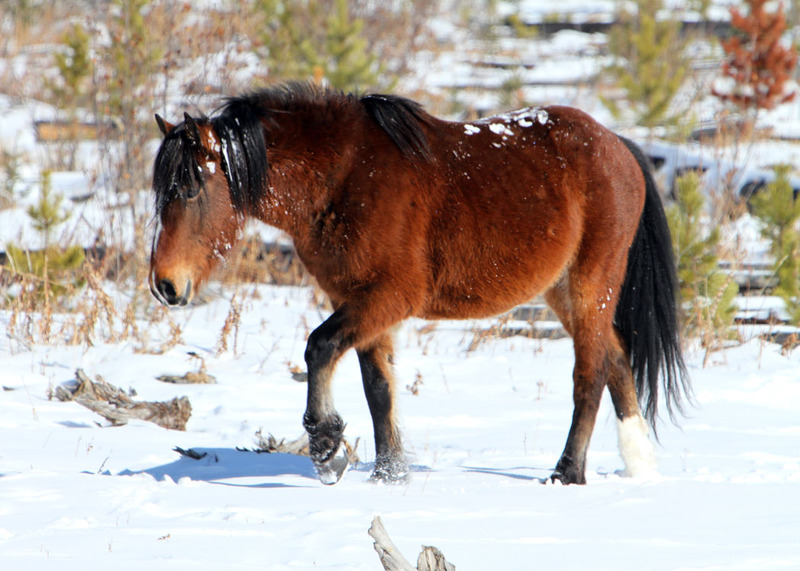 Another sign that spring is on the way is that the wild horses are starting to lose their heavy winter coats. 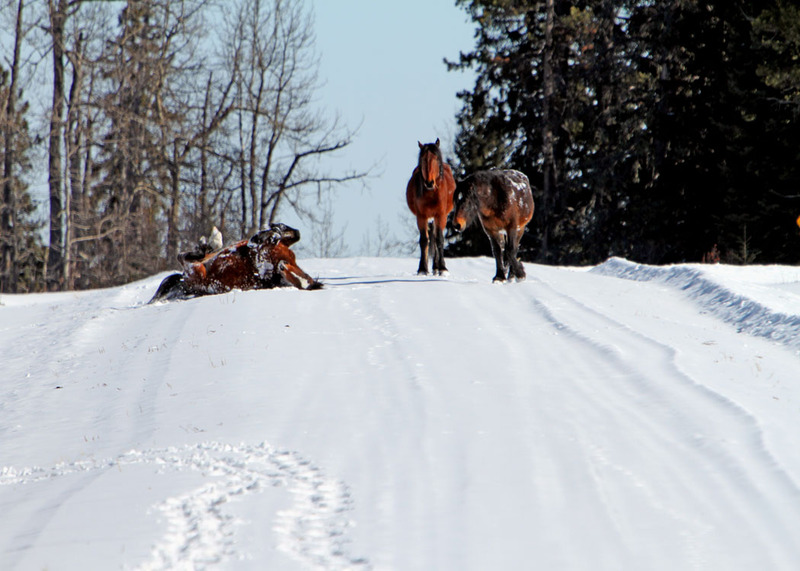 In order to help alleviate the itching and to speed up this process, we find that every time we are out we notice a lot of the horses rolling in the snow. It is obvious to us by their body language that this feels so good for them. On our last journey out to observe the wild horses, we came across these three young bachelor boys who became so fascinated with us and the dogs that they came strolling down the road to see what we were all about. It was fun to watch their antics, as they came within 20 feet of us then stood there cocking their heads as they watched our antics and the dogs. They made no attempt to move off and instead it us that finally moved down the trail. It is moments like this that keep the wild horses so precious in our hearts. Take a close look at this young boy’s hoof and notice how perfectly shaped it is. 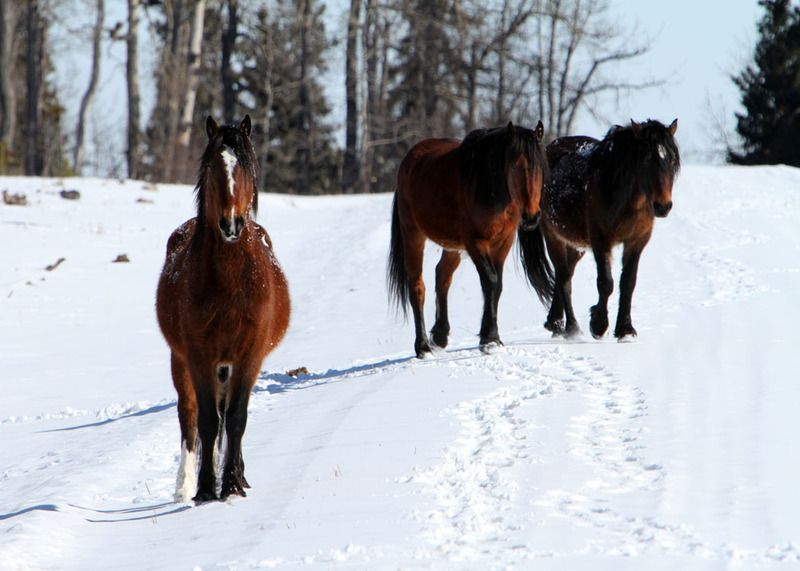 This is a fantastic trait that has evolved in the wild horses of Alberta. Due to the fact that they are constantly on the move and using their hooves to forage for feed, their hooves are naturally trimmed down. A wild horse without sound feet cannot survive. One of the saddest things I see as a horseman myself are the number of domestic horses whose hooves are overgrown and in some cases deformed due to neglect. Due to the strength of the wild horse hoof and its perfection, a lot of farriers are looking at this and adapting their farrier skills to mimic this on the domestic horses they work on. 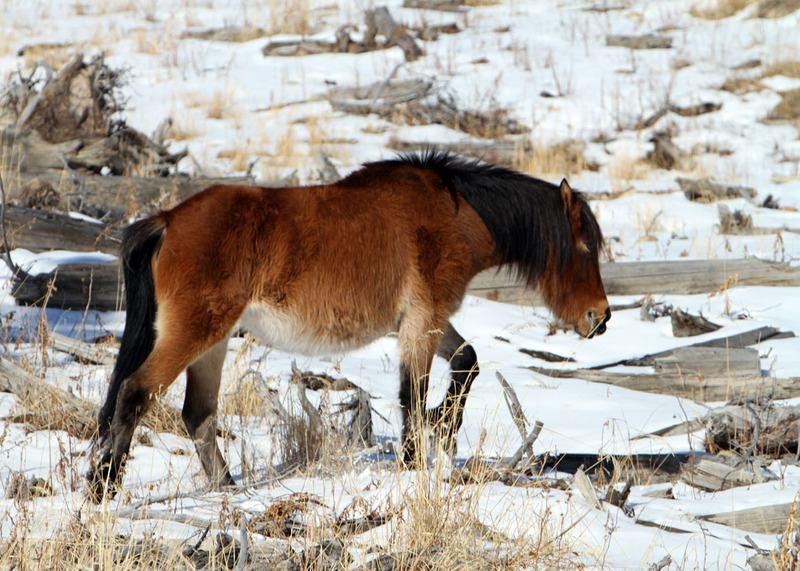 All these physical characteristics that allow the wild horses to survive in such a harsh environment, show us that they do belong with all the other wild animals. Probably one the behaviours of a wild horse stallion that still endures them to me, is the way they will always put themselves between their herd and perceived threats. 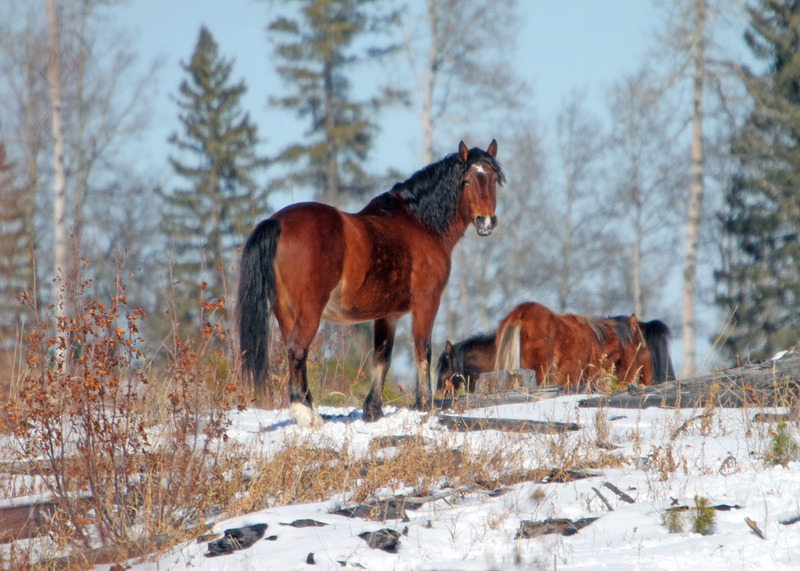 Here is one magnificent stallion who is giving us the eye until his herd has found the safety of the forest beyond. Got to love them! I felt compelled to write. I just read a National Geographic article about the wild horses. The rounding up and culling is appalling! I have two rescue greyhounds, and I can’t imangine the life they have been through. I wish everyone would just leave the horses alone. Can’t they look at them and see what beautiful animals they are, seriously, throw a bail of hay out for them and don’t worry about your precious grass. I just came across your website and I love it, thank you for looking after these gorgeous horses, I love what you are doing!